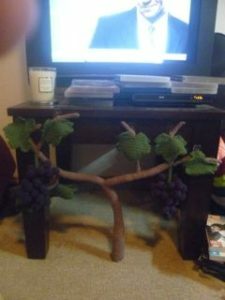 People said I couldn’t have a grapevine because I live in a tiny apartment. WELL I SHOWED THEM!!! This pattern uses 12 ply brown and purple wool, 8 ply green wool, a 4 mm hook, a 3.5 mm hook and a 2.5 mm hook. I made my vine quite small (my table is small and I need to move on to my dad’s fathers’ day present) but you can make it as large as you like. 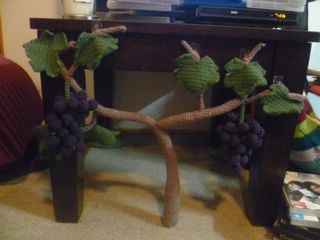 Just keep making bunches of grapes, make longer branches, make more of them or different lengths etc. Round 4: decrease until the hole closes. Sew the medium stems to the main stem and sew on the grapes. This will take ages, trust me. Sew the second branch to the main stem. 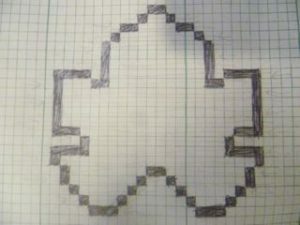 Sew the tiny stems to the second branch and the main stem. The pattern is here. 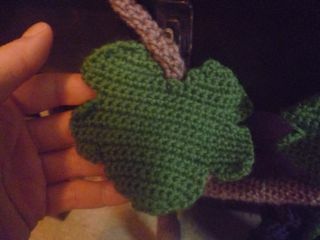 Use green 8 ply wool and a 2.5 mm hook. I made 7 leaves before I got bored. You may do better. There is a bigger picture on Ravelry. Don’t mind the faint arrow pencil marks. I use those to remind myself which way each row is going. 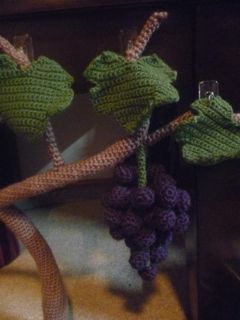 Sew the leaves onto the vine. I used clear adhesive hooks that are normally used for hanging pictures to attach the vine to the table. I attached the base of the main stem to my carpet using a safety pin.